Although my family loves just about any vegetable you could mention, we do have our favorites and beets are certainly one of them. There is just something magical that happens to a simple beet once it is roasted and all the natural sugars become caramelized. Although we love beets, for some reason, I have not roasted beets once since we returned from Umbria last fall. That changed this weekend after I visited our local fame’s market, and I found a large basket of gorgeous beets on display. My favorite ways to serve beets is to roast them first, then peel them, and then to drizzle them with a flavored dressing such as this tasty orange juice, balsamic vinegar, and anise seed reduction. Though beets have the highest sugar content of any vegetable, beets are low in calories, high in fiber, and rich in iron. 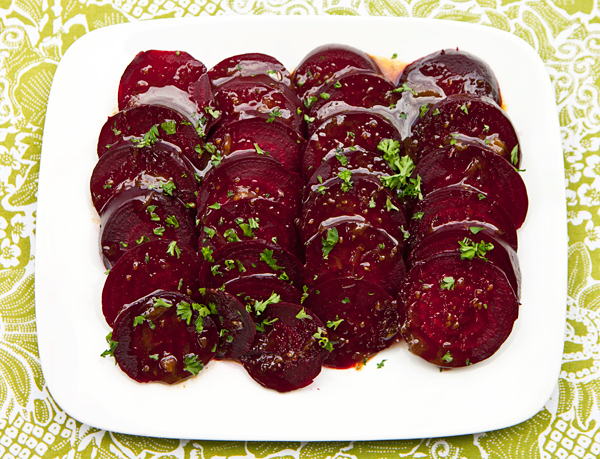 Beets are also a good source of beta-carotene and folic acid. Olive oil is the chosen oil for the dressing which is a heart healthy mono-unsaturated oil with good antioxidant properties. Roasting beets caramelizes the natural sugars enhancing their flavor. Place the beets in a casserole and cover with foil and bake until fork tender about 45 minutes. While the beets are cooling, heat the orange juice, vinegar, anise seeds, sugar, salt and pepper and bring to a boil. Cook the orange juice mixture until reduced to just a couple of tablespoons, about 12 to 15 minutes. Once cool, peel the beets and arrange on a platter. Drizzle the reduced orange juice mixture on top, garnish with chopped parsley and serve. ©2019 Recipe Rebuild. Design by Purr.